A lot of people have been updating their statuses on Facebook saying how lousy 2010 was and how they hope 2011 is better. I had a pretty good year, and a lot of my memories of 2010 are wrestling related. Of course they are, that's why I'm writing this blog. I'm going to break this into a two different categories, my favorite things that happened in wrestling on the national level and then what I personally experienced this year. Lots of cool things happened in the WWE (I'll stick with that because it's what I watch the most of). First and foremost was the return of Bret Hart. Him making up with Shawn Michaels in the middle of the ring was one of the best moments of the year in my opinion. Getting the chance to see Bret "wrestle" at Wrestlemania was also a highlight for me. Obviously the "Hitman" is well past his prime and the match was far from anything Bret did back in they day, but it was awesome to get to see a Hall of Famer and legend have one more Wrestlemania moment. I'm glad was there to see it. This match also helped to launch the Hart Dynasty into the spot light too. While that push didn't last very long, it was great to see them win the tag team titles and at least have a little run on top of the tag team division. Another high point of 2010 was the creation of NXT. I thought the first two seasons were really good. We got a chance to see the development of several guys who will truly be the future of the business at some point. Daniel Bryan, Wade Barrett, and Husky Harris in my opinion are the standouts of the shows. I look forward to seeing where these guys head in the New Year. 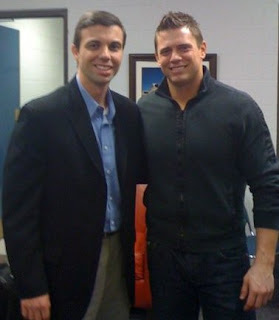 Another personal highlight for me came in January when I got to meet the Miz. 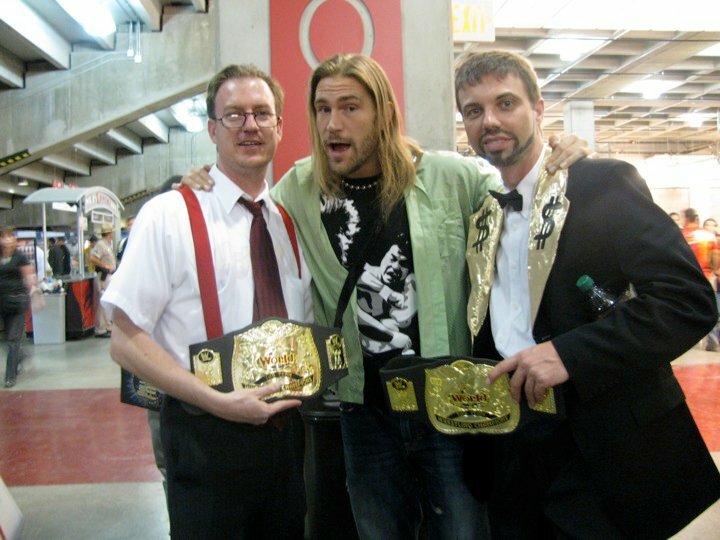 He was in Cape Girardeau for a house show at the Show Me Center. Cape is about an hour from where I live and in the television market where I work. I made arrangements to interview a Superstar prior to the show. Up until a few days prior, I had no idea who it would be. I was very excited to learn it was the Miz. Although I was nervous at first, not knowing exactly how he'd act. But to my surprise, he was very cool and not at all the cocky character he plays on TV. We spoke for a bit before the interview and afterwards too. He also posed for a picture with me. It was truly an awesome experience. So you can imagine that I am happy with the fact that the Miz is the current WWE champion. He's worked hard and I'm glad to see that his dedication over the last several years has paid off. It's also my hope that we see the Miz continue to hold onto the title and stay in the main event picture in 2011. One of the best of all time hung up his tights for the last time in 2010. At least I think Shawn Michaels is going to stay retired. It was awesome being able to see his last match in person. He had a great showing against the Undertaker at Wrestlemania 26. The two also tore the roof off at Wrestlemania 25 in Houston the year before. I am proud to say I was in attendance for that match too. Also got to see Shawn's stellar performance against Ric Flair in what we all thought would be Flair's last match at Wrestlemania 24. Just being at Wrestlemania was a highlight of the year too. Being at Axxess, the Hall of Fame, and the event itself was phenomenal. We participated in a panel discussion about the WWE Network while at Axxess. Then after the Hall of Fame, we saw several of the stars up close as they left the building. 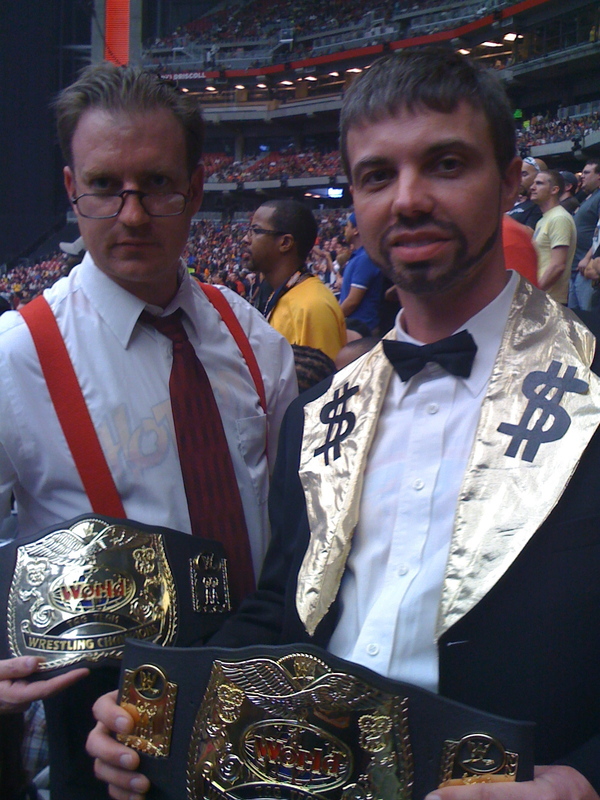 Then dressing up like Money Inc. with my friend Chad was truly awesome. We dress up like someone each year we go and I believe our costumes at Wrestlemania 26 were the best we'd done so far. 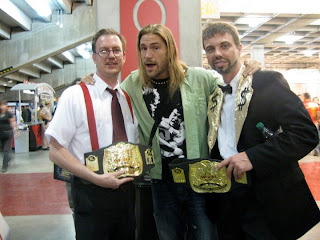 We got a lot of compliments on our attire even from Ring of Honor star Chris Hero. He asked to get a picture with us too, another cool moment from the year. In 2010, I also had a chance to referee a couple of matches for a local independent group. USCW was running a show in McLeansboro and they had asked me if I'd be interested in helping with the show. Of course I was, and got to ref two matches that night. It was really cool, as I had never done anything like that before. So, that's my year in a nutshell. Hope you have some great memories too. Here's to 2011 and hopefully more opportunities. Check out my My 1-2-3 Cents on YouTube too. I'm working on getting more videos uploaded.